Controlling traffic through work areas is one of the most important – and dangerous – operations in construction maintenance. 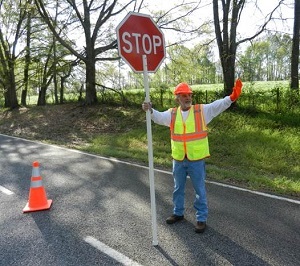 National Safety Council Flagger Training is a comprehensive skill-building course that meets federal industry guidelines: the Manual on Uniform Traffic Control Devices (MUTCD) and the ANSI standard ISEA-107-2015. The Office of Highway Safety, the Federal Highway Administration, and several state Departments of Transportation have reviewed this program. The primary objective of Workzone Flagger Training (Novice) is to train flaggers to provide safe passage of traffic through and around work areas and to minimize confusion by bringing standard flagging procedures to our nation's highways. This program will have crew members trained and certified in safe flagging techniques in just four hours. A local National Safety Council training center can arrange to teach this course on-site at a location convenient for your crew. Price may vary; contact the administering office directly for additional information. Training course only, no job or job placement is offered or guaranteed.